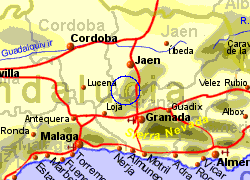 The town of Alcala la Real, in the province of Jaen, lies approximatley 40Km south of Jaen city and 40Km north west of Granada, in an area that principally grows olive trees together with almonds and cherries. With it's impressive La Mota castle dating from the year 727, on raised ground overlooking the town, the area was the site of many battles during the times of the Moors and Christians. 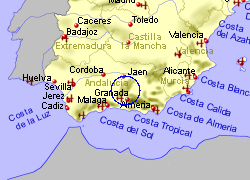 The town also has a triangular shaped Alcazaba having three towers each of 20m height. Alcala la Real has a full range of facilities including a modern hospital, shops, supermarkets, and several bars and restaurants. There are a number of lakes in the area where you can swim or fish. 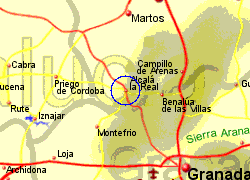 Map of the Alcala la Real area.